The 1200 Custom is an interesting motorcycle with a lot of promise. Interesting because it is positioned in Harley's Sportster line-up and Harley-Davidson's speciality lies in making motorcycles that are the exact opposite of sporty. Promising because it claims to offer an involving ride while fixing the fundamental flaws of its sibling - the Forty Eight's tiny fuel tank and lack of a pillion seat. Shumi quite enjoyed his 1200 Custom ride on Rajasthan's smooth and fast roads but it's time to see how it performs in the everyday real world. Big points go out to just how easy this motorcycle is to simply hop onto and ride off. Large Harleys are intimidating beasts, especially at low speeds but the 1200 is different. The seat is low, the pulled back bars are easy to reach and the steering isn't very heavy despite that enormous 130 section front tyre. First impressions? This ranks as among the most friendly Harley-Davidsons around. Perhaps my favorite thing of the 1200 Custom are the sensations felt when it starts up. 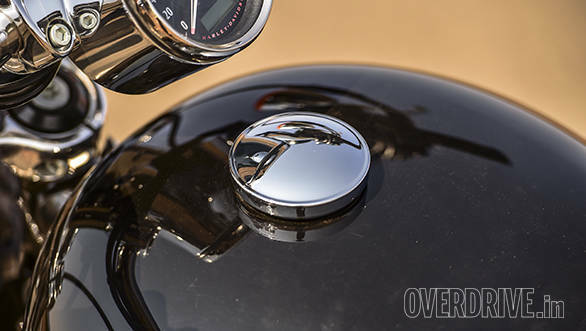 Thumb the starter button and the familiar Evolution engine from the Forty Eight slowly chugs to life. In the process, it sends a great big shudder through the entire frame before the engine settles into a strong, off-beat thump. It's a strangely likeable, old school sensation that feels powerful, industrial and almost indestructible. The downside is that the vibes at idle are so strong I found myself turning off the engine at traffic lights to save my head from being shaken into an ache! More opportunities to experience that visceral start-up phenomenon then. Pulling in the clutch, there's a distinct sense that it is firm but will only prove to be painful in jammed traffic. The big air-cooled lump also gets plenty hot in slow traffic, something slipper and shorts wearing superstuds will quickly discover. The five-speed gearbox slots home with an alarmingly loud, almost agricultural clunk but noise aside, it's quite precise and happily allows clutchless upshifts and quick, multiple downshifts. With a big hearted, slow revving twin like this, the natural assumption is that there's torque for days. And there is; a mild twist of the throttle produces a rapid turn of pace at anything above 2,000rpm. At 100kmph, the engine is lazily spinning at 2,700rpm but is also in the meat of the powerband and 140kmph is but a thought away. Flat out, we recorded a 0-100kmph time of 5.3s which is respectable. I managed to see 170kmph and in the right circumstances, an indicated 180kmph should be achievable. Its overall efficiency of 18.5kmpl isn't bad either. Given the sheer pulling force, it's easy let the revs fall low and expect the Custom to just pull its way out but the motor isn't very pleased to oblige. 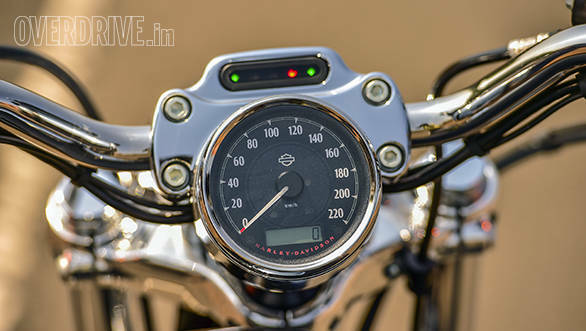 All forms of clanging and clattering sounds are produced below 1,800rpm and the vibes increase to the point that you start scanning the mirrors to be sure things aren't falling of the motorcycle. Interestingly, there isn't any real danger of a stall, ignore the grumbling and the engine will chug along until revs drop to about 1,200rpm mark. At which point, the engine has had enough of the rider's laziness and angrily demands a downshift. 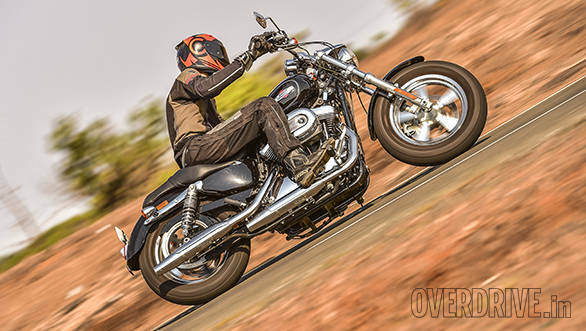 Still, with all that grunt, the 1200 Custom is a capable tourer and its 17-litre fuel tank is far better than the Forty Eight's 7.9l tank that pretty much holds peanuts. However, the engine never settles into that sweet spot of eerie calmness you experience with the bigger motorcycles from Harley's Touring line. At about 90kmph, those engines get so smooth and quiet it feels like they're running on electricity. And finally we arrive at the question, just how sporty is this 'Sportster'? Relatively speaking, it's up there with the best from Harley-Davidson. The front end isn't very raked out and trail is lower than most Harleys, Forty Eight and Street 750 included. The result is a front end that actually has a decent amount of feel, enough to tip the 1200 into corners with conviction. Chassis stability feels unshakable and before you know it, the long footpeg feelers are scraping tarmac, the right side sooner than the left as the exhausts reduce clearance slightly. The confident handling is great fun but the scraping pegs quickly become an irritant. You can tell the chassis has more to give but the sheer lack of clearance poops on the party. 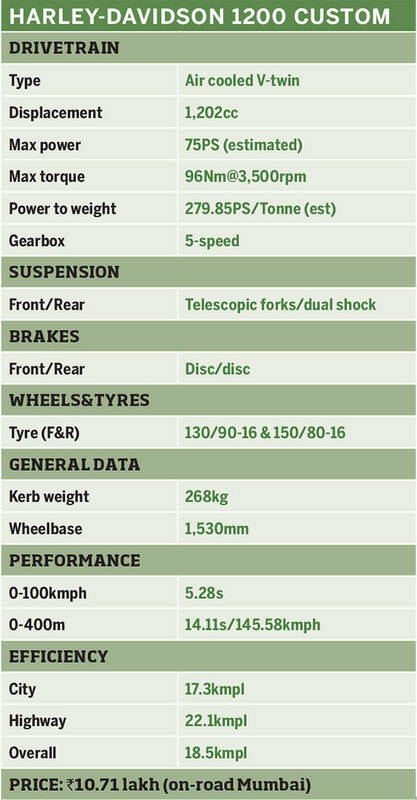 Braking performance is pretty good too and again this is down to the feelsome front end. You can gauge to a decent extent how much grip the front Michelin Scorcher tyre has, allowing almost exclusive use of the front brake, not something many Harley-Davidsons will encourage. You do have to be extra careful though because Harley-Davidson have inexplicably decided to not offer the 1200 Custom with ABS. Ride quality however leaves a bit to be desired. It's decent on smooth roads but firm and crashy on everything else. It particularly dislikes concrete roads, the type Mumbai is full of and even when they look smooth, the 1200's rear shocks somehow pick up the minor irregularities in the road and give your spine a good rattling. 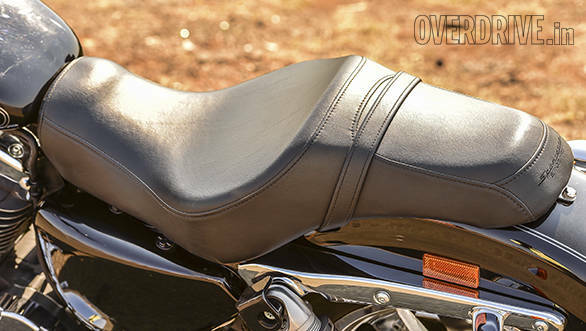 The feet and arms forward seating position makes it next to impossible to stand on the pegs over bumps which leaves your lower back and gut to handle impact absorption duties. Not very pleasant. Ground clearance is also of concern. It's 6mm higher, better than the ridiculous 99mm of the now discontinued Super Low, but still scrapes speed breakers with far too much ease. For some perspective of just how low this motorcycle is, a warp-speed missile like the Suzuki Hayabusa has 120mm of ground clearance. I like the 1200 Custom. I think it's a subtle but good looking motorcycle with just the right amount of chrome. Not particularly a motorcycle for someone looking for flash but good looking nonetheless. 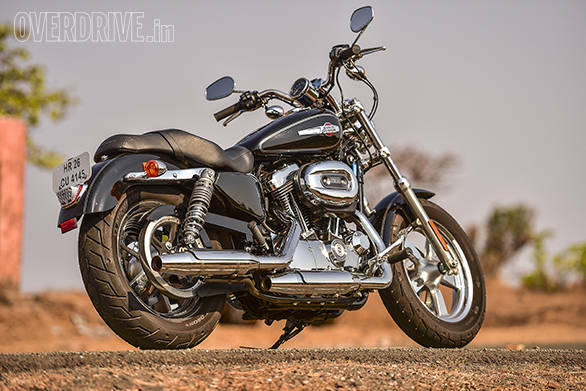 The engine is characterful, the chassis enjoyable and in the Harley universe this is a very playful motorcycle. 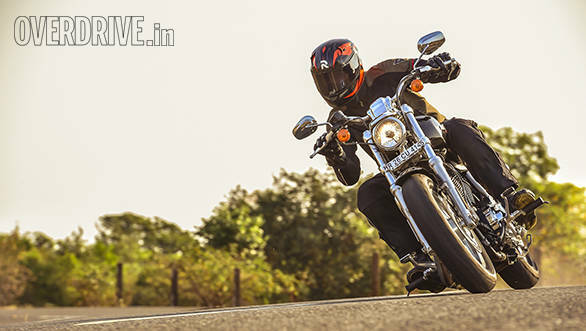 Ride quality is not traditionally a Harley strong point so we won't bear on that too much. All told, perhaps not as handsome as a Forty Eight but the 1200 Custom is a better motorcycle in almost every sense. At Rs 10.71 lakh on-road Mumbai its a few thousand cheaper as well. But for the love of me, I cannot understand why Harley-Davidson would choose not to offer ABS especially when its sibling gets it as standard. No motorcycle at this price point should be sold without ABS, it's just not done. Triumph's brand-new Street Twin and Bonneville T120 both cost less and offer it as standard along with traction control! And thus, while the 1200 Custom has many compelling qualities there are also some issues you should seriously consider before making a buying decision.